Jerome LOL is one of the main reasons you love what you love. He's an integral part of the merging of electronic music and internet culture, he's always lightyears ahead of everyone else and it's obvious from his work that he loves being there. We chatted with Jerome LOL about his feelings on collaboration, copyright and the future of internet culture. 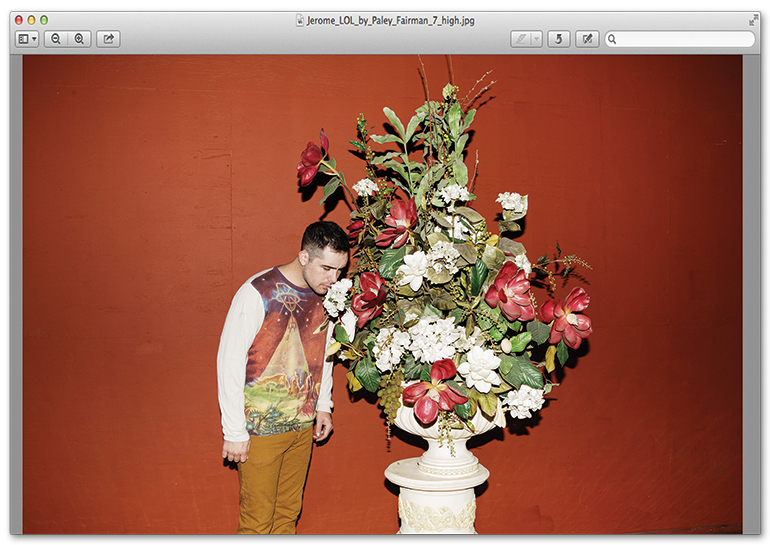 Keep up with all things Jerome on his soundcloud, twitter and tumblr. Grape: Collaboration is a longstanding part of your work, from LOL Boys, to running Body High and especially in your music videos Changes and Deleted, what attracts you to collaborative work? Jerome: I’m attracted to collaboration, because I never know what the end project will result in. With the videos for ‘Deleted’ and ‘Changes,’ I wanted to give others the opportunity to be creative and make something. With ‘Changes,’ I gave some direction to those who helped create it, but with ‘Deleted,’ I left the creative decisions completely up to the participants. I’m interested in the loss of control with how a project will end up, and it usually ends up being a worthwhile process for those participating. You seem to have a lot of fun with what you do. Do you think it's funny how people might attach meanings to your work? Is any of it just for the sake of it? I do have a lot of fun with what I do. I don’t think it’s particularly funny when people attach meaning to my work, that’s just part of what you expect to happen when you put things out into the public realm. I wouldn’t say I do anything for the sake of it. I may have in the past with other videos I have made when I was thinking more from a purely visual sense, but these days, I tend to think things out before executing them. "I think our generation is more critical of the divide between offline and online life, whereas generations of the future will hardly differentiate the two." Basically, the internet is like one big community, do you think the LOL Boys were the first band whose 'hometown' was the internet? Well, I think there were bands or musical groups who were communicating via the Internet long before LOL Boys. The Postal Service, for example, claims they used the postal service to send back tapes and what not, but I’m sure they were emailing constantly. I don’t think it is uncommon at all anymore for collaborations and projects to grow purely from the Internet. Do you think this singular community helps creativity or do you mourn the demise of the 'local scene'? I don’t think they have to be mutually exclusive. I also don’t necessarily see a singular community on the internet. There are plenty of message boards and websites where a multitude of different communities exist. The demise of local scenes is more due to the fact that users of the internet can tap into any scene they wish online. No longer is one forced to accept the scene where he or she lives. After meeting and working together online as LOL boys, you eventually met up with Markus. Were you ever afraid of a catfish scenario? Was it super awkward finally meeting in person? We had talked online enough and skyped to the point where I knew it would not be uncomfortable. It wasn’t awkward at all meeting in person, since we had so much in common and so many things to talk about. In previous interviews you have mentioned this generation evolving together with the internet, how do you think that's influenced our interaction with web culture / online life? I think our generation is more critical of the divide between an offline and online life, whereas generations of the future will hardly differentiate the two. In the tumblr world, where do you stand on copyright and ownership? Should the internet be a shared space for ideas and inspiration where someones work can be reblogged and re-appropriated? Or should the traditional artist / observer distance be maintained? I think if it is on your screen, then it is yours. What do you think is the future of internet culture? A lot more websites like Buzzfeed unfortunately. You put so much effort into the visual aspects of Jerome LOL; your videos, your site, your chains, how important is this visual side of your work? I am a very visual person, so I think it is important to create a world around the music to live. Since so much music is coming out digitally, there is often a lack of context with music. The visual aspect helps solve that problem. You're obviously pretty involved in the net art scene, who would be your favourite artists? Could you describe their work a little? Michael Manning aka Mirrroring. He makes beautiful paintings and his digital work is unparalleled. As an experienced user, what would you consider to be the biggest difference between life URL and life IRL?